As refrigerators get more complex and offer features such as cold water dispensers, it is becoming more common to feed them with high quality water from an undersink reverse osmosis (RO) unit. The challenge in such hook-ups is how to provide sufficient water pressure for the refrigerator, especially since many of the newer refrigerators and ice machines require more feedwater pressure than older models. With simple filters, just teeing into the undersink filter’s faucet tube works fine, since filters put out essentially the same pressure as the tap water source. With reverse osmosis units, however, a standard system puts out only about 2/3 of the tap water pressure when the RO storage tank is full, and, of course, less as water is taken from the storage tank. If city water pressure is strong–say, 60 psi or more–a standard reverse osmosis unit will usually rise to the occasion and supply plenty of water pressure for the refrigerator. With low city pressure or with well systems that have variable pressure, however, the RO unit may need some help. Various devices are used to enhance pressure output of RO units when they send water to a remote point of use like a refrigerator. Here’s a look at the most common of these. 2. 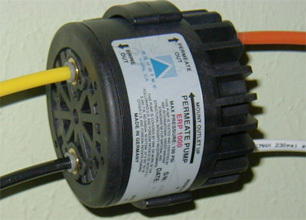 Permeate Pumps. These non-electric pumps do not increase inlet pressure but they isolate the RO unit from the back pressure from the storage tank, allowing it to run much more efficiently. They can be installed with or without a hydraulic shutoff valve. Without the valve they will put much more pressure into the storage tank (and this is what we recommend if your aim is to send higher pressure to your refrigerator). The permeate pump runs on water pressure from the RO drain line and needs no electricity. In addition to sending higher pressure to the refrigerator, it improves the RO unit’s efficiency so that it uses less water. 3. Demand, or Deliver Pumps. These electric pumps are installed after the RO unit and they push water directly from the output of the RO unit to the point of use–e. g., the refrigerator. They can deliver water with pressures up to 80 psi. They work on demand. When the icemaker calls for water, or if you activate the drinking water dispenser, the pump comes on and sends water to the refrigerator. 1. The booster pump is the best choice if your RO unit is starved for pressure. If you have, let’s say, tap water pressure of 40 psi. A standard RO unit will run on this pressure, but not well. What’s worse, it will put only 2/3 of that into the storage tank–25 psi or so even when the tank is “full”–so your refrigerator won’t get much water. The booster pump will run the RO unit excellently and you’ll have a strong 40 psi of pressure in your full storage tank. Booster pumps are quiet and usually trouble-free. 2. With the same 40 psi inlet pressure, the permeate pump, if installed without the shutoff system (the pump itself will take over the shutoff function) will put almost 40 psi in the storage tank. It will also refill the tank much more quickly when water is taken from it. The permeate pump is trouble-free and needs no electricity. The model used with membranes that produce fewer than 50 gallons per day are very quiet. The over-50 gpd model makes a thumping noise that can be troublesome while the unit is producing water. 3. The demand pump will deliver 60 to 80 psi to the refrigerator regardless of the pressure in the tank (that is, unless the tank runs out of water, which can happen if the RO unit is a low producer). The downside is that the pump won’t actually improve the performance of the RO unit, as the other pumps do, but will simply increase the pressure to the refrigerator. Another issue is a phenomenon called “pump chatter.” This doesn’t always happen, but if it does you won’t be able to ignore it. Pump chatter can be described as the pump turning on when no demand for water is made, running briefly–a couple of seconds usually–then turning back off. This problem can be cured by installing a second RO tank between the pump and the refrigerator. The tank provides the pump with constant back pressure which keeps it turned off. It has the added advantage of giving you a couple more gallons of water, stored at maximum pressure and ready to supply the refrigerator. A Practical Guide to Water Treatment Pumps. 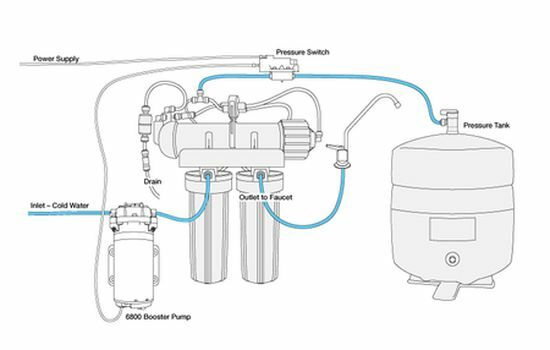 How Reverse Osmosis Booster Pumps Work. How Small Demand or Delivery Pumps Work. This article appeared originally in the Pure Water Occasional.